Previously, on MinerBumping... Agent Salah ad-Din al-Jawahiri impressed friends and enemies alike with his professional handling of Code violators. 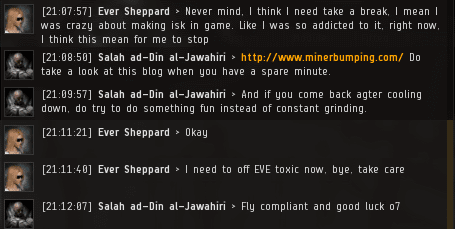 But Salah soon had his hands full when gank recipient Ever Sheppard lost a container with her library of blueprints and threatened to quit EVE. Ever Sheppard's lost Small Secure Container occupied her thoughts. She claimed it contained everything she had in the game. Salah needed to be sure, so he instructed the two and a half year "rookie" on how to create an API key. Our Agent's investigation went forward with the cooperation of the carebear. In an age when every carebear claims to be a destitute newbie, our Agents increasingly rely upon API checks. Only a few minutes into the investigation, Salah had concerns. Ever Sheppard airily dismissed them. Over the years, I've noticed that carebears only disclose information that benefits them; everything else gets downplayed or concealed. By contrast, Agents of the New Order are interested in the truth in all its fullness. Salah had an idea of how he wanted this story to end: He imagined Ever Sheppard proudly embracing a Small Secure Container in her arms. But Salah didn't see himself being ripped off. He wanted a fair deal or no deal. The two struck a bargain. Ever Sheppard's main character began a series of asset transfers to Salah. It was true that Ever had invested most of what she owned in the blueprints, but the remainder could go to Salah. Now it was time for our Agent to fulfill his end of the deal. To his relief, Salah was able to locate some reasonably priced Small Secure Containers. Before long, buyer's remorse reared its ugly head. Salah was surprised by how quickly Ever Sheppard alternated between greed and grief. It was then that it occurred to Salah that a minor miscommunication had taken place. Salah had assumed Ever Sheppard couldn't have been asking for the return of the Small Secure Container she'd lost. As the killmail indicated, that item had been destroyed. The carebear took no responsibility for her part in the loss of the container or for the confusion that followed. I've noticed that carebears tend to lack empathy. I bet Ever Sheppard never even considered how Salah might've felt about the loss of his gank Talos. She was too wrapped up in herself to think about someone else. Nevertheless, Salah didn't want Ever Sheppard to quit EVE--at least, not permanently. He suggested that she join the New Order and become a ganker. But the carebear was beginning to think she was bad at the game, and therefore not cut out for elite PvP. Again our Agent encouraged the distraught carebear. He was the only person in the game willing to listen to her complaints. The Anti-Gankers and the theme park crowd, as ever, were nowhere to be seen. In time, Ever Sheppard came to realize that she'd been wrong to spend her days mindlessly pursuing isk. Her future in EVE was uncertain. But now, at least, she had a chance. She'd received insights and a greater capacity for introspection--all courtesy of the New Order. There could be no doubt that her mentor, Agent Salah ad-Din al-Jawahiri, had earned his paycheck that day. Agent Salah ad-Din al-Jawahiri may just have saved a marriage. So much win. Who else but CODE. would help a character like that who's at their lowest? The Code ALWAYS winning and making Eve GREAT Again! CODE brings such happiness to the universe, I'm sure secretly he was happy he donated a ship towards the new order cause! James should run for CSM. When he wins he can build a wall around hisec to keep out the miners! AND make them pay for it!